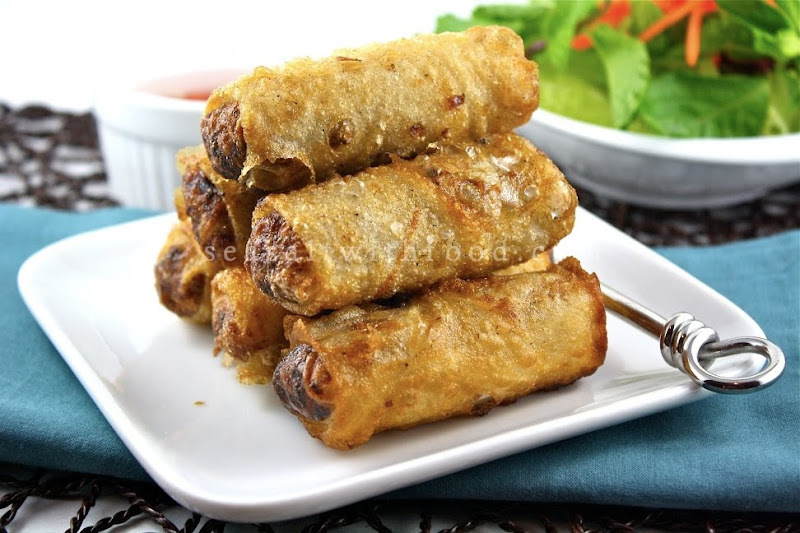 These are Vietnamese Spring Rolls or aka Cha Gio. These deep-fried spring rolls are crispy and they are great appetizers. 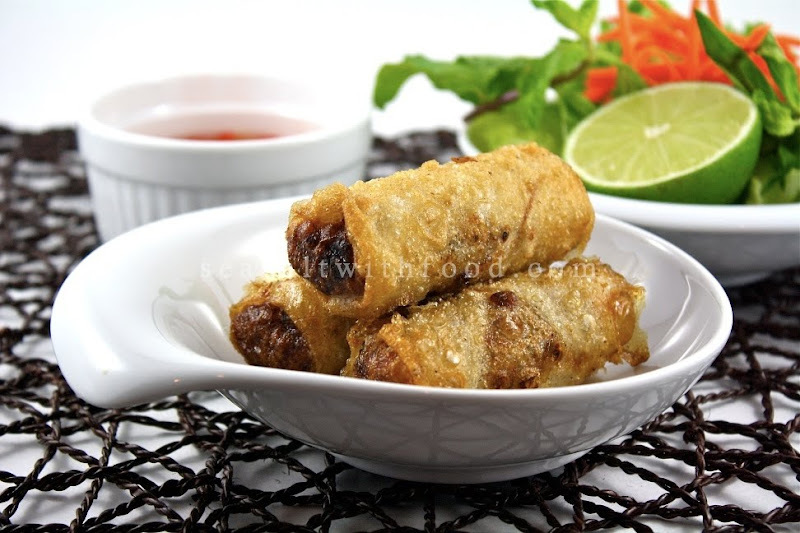 Simply wrap the spring rolls with some lettuce leaves, fresh herbs, and then dip-it lightly into the dipping sauce. Delicious! In a large bowl, combine the pork, crabmeat, onion, taro root, cellophane noodles, scallions, mushrooms, fish sauce, garlic, sea salt, sugar, and black pepper. Using a fork, gently mix all the ingredients until well blended. Then add the beaten egg and toss to coat. To make the rolls, fill a large bowl with warm water. Add the 2 Tbsp sugar to the water and stir to dissolve. (This helps the rice paper turn golden when fried and crispier texture) Quickly dip the rice paper into the warm water and turn to moisten the sheet completely. Lay the sheet on a damp kitchen cloth before using. Spoon 1 heaping Tbsp of the filling on the bottom third of the sheet. Using your fingers, press the filling gently and shape into a small cylindrical shape. Lift the bottom edge over the filling, and then fold in both sides. Roll into a small cylinder, about 2/3 inch wide and 2 inches long. Place the seam side down. Do not stack the rolls. Cover lightly with plastic wrap to prevent from drying and continue to make the rolls with the remaining filling and paper in this way. If a wrapper has a tear, reinforce it by patching it with a small piece of dampened rice paper. In a wok or a large skillet, heat 2 inches of vegetable oil to about 350˚F (180˚C). Test the temperature by carefully placing a spring roll in it. If the oil foams but not too vigorously upon contact, it is hot enough. Add the rolls without crowding, and fry until crisp and golden brown, about 5 to 6 minutes. (Cook in batches) Remove the spring rolls with a slotted spoon and drain on paper towels. Serve the spring rolls immediately with the dipping sauce and table salad. Note: Vietnamese Dipping Sauce: Mix together 2-3 Thai Bird's Eye Chilies chopped), 2 cloves Garlic (sliced), 3 Tbsp sugar, 2/3 cup warm water, 1 1/2 Tsp Lime Juice, 5 Tbsp fish sauce and 2 Tbsp shredded carrots. Ohhh, thank you so much for this recipe! I adore Cha Gio (pronounced cha-yo) and have since the first time my Vietnamese co-worker brought in a platterful for a workplace potluck. Be sure and let people know that the "table salad fixin's" are of prime importance. Fresh, crisp romaine leaves, mung bean sprouts, sliced jalapeno, cucumber sticks, basil and mint leaves and of course, the dipping sauce. I'm off to explore the link you included; thank you so much! Gorgeous pics! Ooops, I forgot the shredded carrot and lime; and I always have sriracha on the table too! I love these. Is a must order for us each time we went for our Pho noodles. I tried making this once but I can't seems to get it to brown evenly and the wrappers get soft and sticky after it cools down. Do you have the same problem? @ICook4Fun: Likewise! As for the wrapper, mine remains crispy even after they cool down. I think the method of adding sugar to the water actually works. The wrappers browned evenly too. Hi! Just a random reader. I don't mean to sound like a spazz, but I actually just had a discussion about this with a Dutch friend a few weeks ago (I'm studying abroad in Japan and when I was complaining about missing Spring Rolls, she got confused). Aren't these actually called egg rolls? I always thought Spring rolls are the ones that aren't fried because all the fillings (lettuce, herbs, bean sprouts, shrimp, pork, etc) makes the roll look like Spring time. 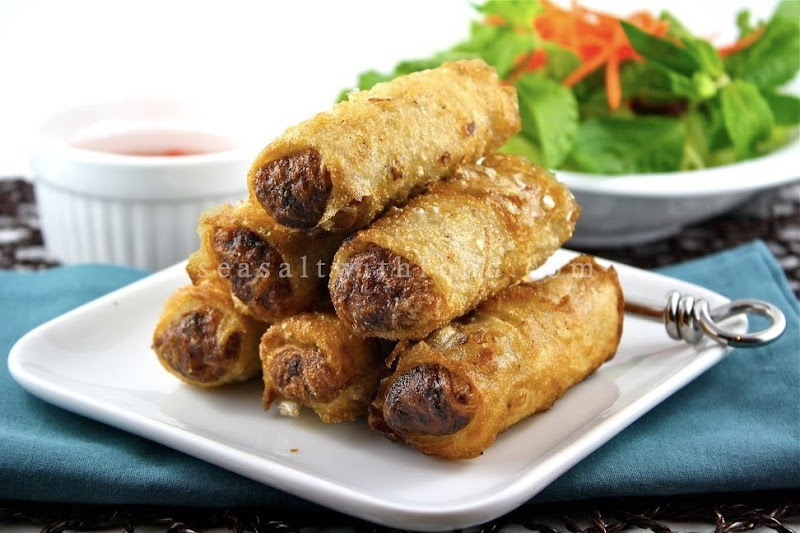 Your recipe doesn't require that many eggs, but usually eggs are used to help with the fluffyness of the taste (and so a lot are added), and when using "Egg Roll" paper (instead of frying Spring Roll Rice paper) egg is used to help the ends stick. Anyway, I just wanted to say that. I hope I don't sound like a know-it-all, but since it was fresh on my mind, I thought I could ask. @Gee: Thanks for the comments. I think you might have mistaken with the Chinese egg roll recipe. Vietnamese spring rolls used dried rice paper to roll the Cha Gio and spring roll rice paper for fresh spring rolls or also known as summer rolls. Hi, I'm new to frying spring rolls. How do you ensure that the pork filling is thoroughly cooked? yummy I always wonder if this spring roll use the same rice paper as the non frying one. thanks for the recipe! @Wendy @ Obesebaby: They are not the same. @Anonymous: Thanks for the comments. Sorry, I can't remember the rice paper brand. However, I will be making some soon; will let you know by then.